Eight years after the first game, they're still Bubblin' and Bobblin'. Two unused (but almost finished) enemies can be found in the game's tiles. An odd shadowy enemy. Seems it would spin around and do, uh, something. Walking? A panicked version of the spinning animation is present as well, and so is a tiny version of this enemy. 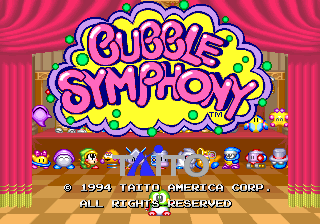 The tiny version could be a sprite for when this unused enemy is captured by a bubble. An unused boss! This is a giant version of the Dranko enemy. The pointing animations would be used for attacks. 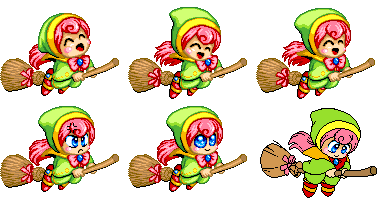 Along with the standard death animation, a range of different emotions are available for this boss. The last frame has not been finished, missing the complicated shading found on the other frames. 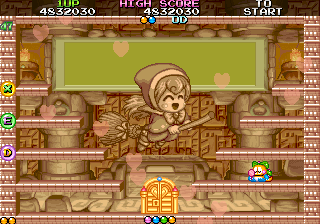 However, one of the Super Dranko sprites did make it into the game; it was altered and used in the background of the fifth Treasure Room you can visit during one play-through. Two different bottles that would have been thrown by Super Dranko. Small and large fireballs, as well as a big star. This is basically a giant version of the Dranko enemy's attack. These lightning bolt graphics, however, aren't similar to any attack by the Dranko enemies. This might have been spawned by the silver bottle. An unused level icon. These books are in the same styles as the one found in the prologue, and are most likely from a scrapped stage. This is a level icon for the starting stage. Since there's no door that leads to the first stage, there's no use for this icon. 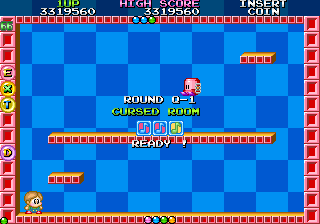 By moving up a level from the Hyper Drunk stage, the player will enter the training stage, displaying an otherwise unseen level name: "Cursed Room". Completing this level leads to World A-2. DEBUG ME! USE THE FORCE! DEBUG ME! WHERE DOES THE ANSWER LIE? 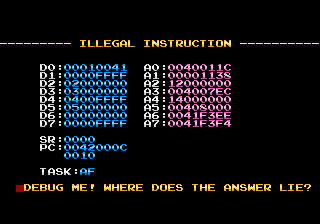 When an error occurs, a screen appears along with an encouraging message for the debugger. An incomplete set of internal sound names can be found, fragmented, on various ROM chips. This page was last modified on 18 December 2017, at 00:19.